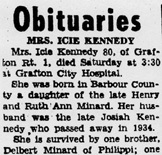 Icephine "Icie" (Minard) Kennedy was born in 1880 in or near Philippi, Barbour County, WV, the daughter of Henry C. and Sarah Catherine (Croston) Minerd. Josiah Kennedy, Jr. was born in 1878 in the Webster community of Taylor County, WV, the son of Josiah and Ruth Ann (Minerd) Kennedy Sr. Josiah was tall, with brown eyes and black hair, and faced a lifetime of racial discrimination due to his mixed-race heritage. Icy and Josiah were married on March 28, 1903 in Barbour County. At the time, she was about age 22 and he about 24. On their marriage license, both are listed as "color’d." When the federal census was taken in 1910, the Kennedys resided in Barbour County, where Josiah labored in a local coal mine. Living in their home that year were nephew Howard L. Kennedy, brother Benjamin Harrison Kennedy and boarder John Thompson. In 1917, they resided in a rural section of Grafton, where they were farmers. That year, at the age of 42, Josiah registered for the military draft. On the card, he marked his race as "white" but the draft board officer wrote, "Considered colored by people - as he attended colored school." He was unable to write his own name, and signed documents with an "X." When the census was made in 1920, Josiah's 68-year-old widowed father made his home under their roof. The Kennedys are believed to have purchased a tract of land from Josiah's widowed father circa 1923. In 1930, the census shows the Kennedys residing in Knottsville, with Icy's unmarried brother Delbert Minard, a farmer, living in their household. Circa 1934, the Kennedy residence was near Stone House, in the vicinity of Grafton, Taylor County. [He] was born and raised in the community where he lived all of his life. Mr. Kennedy was a Christian man and led an exemplary life. He was a good neighbor and a considerate husband and father. 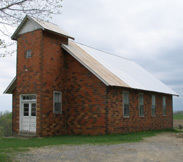 He was a member for many years ... of the Cecil Wesleyan church, and was faithful in attendance when circumstances permitted." Josiah died at age 55 on July 8, 1934, caused by nephritis and bronchial asthma, known as "dropsy" at that time. 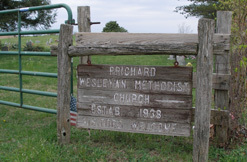 He was buried in the Pritchard Cemetery following a funeral at the Cecil Wesleyan Church preached by Rev. Fred Decost. Josiah's grave is not marked today, if it ever was. Icie outlived her husband by almost three decades. During World War II, she was named next of kin on the draft registration card of her brother Delbert. She passed away on Dec. 8, 1962, at the age of 80, and is buried at Pritchard, with a stone marking her grave.